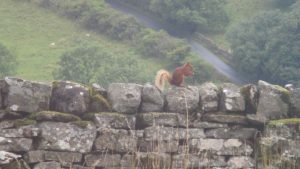 Raydale Red’s: Squirrels that is! 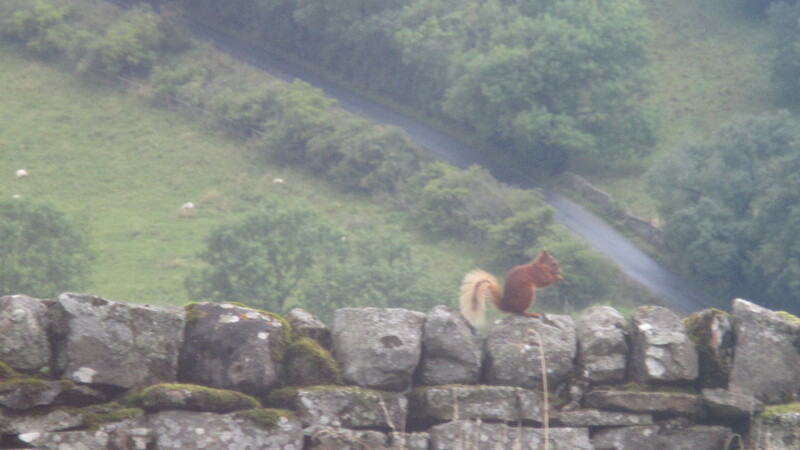 Over recent years we have had the odd occasional glimpse of a red squirrel in our garden from time to time, though I never managed to obtain photographic proof that they had ventured into Raydale: until last week! While this part of Raydale is free of grey squirrel, giving the reds a chance, it is a long way from other established colonies of red squirrels in the area, most notably at Snaizeholme and Cotterdale. It is hard to tell if they have managed to get here in numbers to allow them to breed or if they are just exploring the area. Though they are known to range quite a distance, it does not seem feasible they are just coming over here for the day! Certainly, we have seen them in early morning feeding on our raspberries and in the late afternoon, so they would have to set off early and leave late. Following advice, we have put out a small selection of nuts and seeds every two to three days on a high section of garden wall, near to the cover of a tree and this appears to have attracted a red squirrel to this part of the garden. Whether there is more than one is also hard to tell. All we know is that it comes along the wall from the west, and we have seen it pass through our garden into the wooded ravine at the side of our neighbours garden. What is certain, is the joy of having these little creatures visit the garden does not diminish with the frequency they have been visiting recently.